Russian officials on Thursday (7 August) steamrolled tonnes of cheese, fruit and vegetables, defying public outrage to begin a controversial drive to destroy Western food smuggled into the crisis-hit country. Last week, President Vladimir Putin signed a decree ordering the trashing of all food — from gourmet cheeses to fruit and vegetables — that breaches a year-old embargo on Western imports imposed in retaliation for sanctions over the Ukraine crisis. 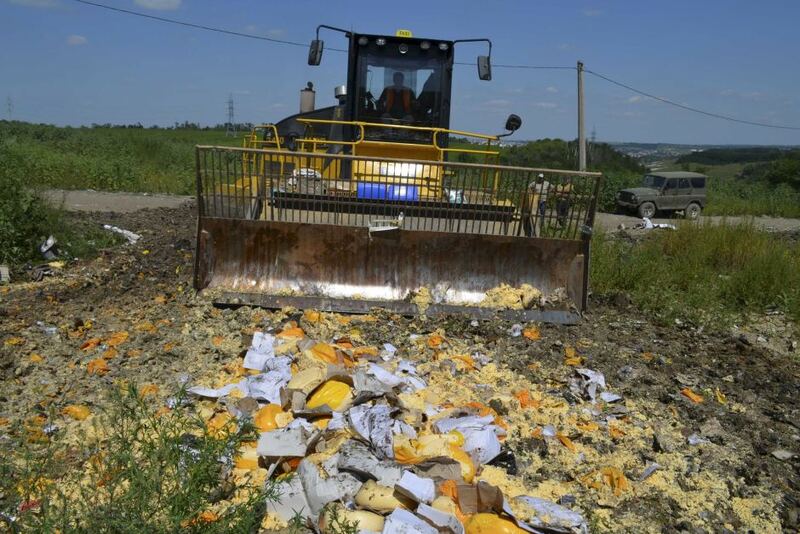 Russian television showed officials dumping truckloads of round bright orange cheeses on a patch of wasteland and then driving over them with a steamroller in the Belgorod region bordering Ukraine. The cheeses arrived from Ukraine in unmarked boxes, but were most likely produced in the European Union, a reporter at the scene said. A spokeswoman for the food safety agency Rosselkhoznadzor said that the flattened cheese — amounting to almost nine tonnes — would be buried underground. “From today, agricultural produce, raw products and foods, which come from a country that has decided to impose economic sanctions on Russian legal entities or individuals … and which are banned from import into Russia, are due to be destroyed,” the agriculture ministry said in a statement. Moscow last year banned a slew of food products from the West, ranging from delicacies such as Parmesan, pate and Spanish hams and to staples such as apples. Food brought in for private consumption is still permitted. Russia complains that some importers are circumventing the ban by illegally slapping on new labels that claim the food was produced in neighbouring ex-Soviet countries. The food safety agency has said it planned to destroy several hundred tonnes of contraband produce on Thursday that has already been seized. Two truckloads of European tomatoes and three of nectarines and peaches were being smashed with a tractor and bulldozer in the Smolensk region after they arrived with fake documents, the food safety agency said. One truck driver carrying a cargo of suspicious tomatoes turned his vehicle around and made a getaway back into Belarus to avoid them being destroyed, Rosselkhoznadzor said. Yulia Melano, spokesperson for the Russian food standards watchdog, said 114kg of pork product with Brazilian labelling was seized on the border with Kazakhstan after customs authorities determined the probable origin was an EU country. It was ground down to make livestock feed. A source in the food safety agency warned that officials who opted to “destroy” gourmet delicacies by eating them would face criminal charges, pro-Kremlin Izvestia daily reported. An online petition calling on the Kremlin to rethink the law has been signed by more than 170,000 people , saying it is grotesque to destroy food in a country where millions still live below the poverty line. Food is not the only sector to suffer. From 10 August, there will be increased checks on Dutch flowers arriving in Russia, following claims that some of them contained bugs and parasites. A further set of bans is under discussion which would restrict the import of a number of medical items, including x-ray machines, tampons and condoms, according to the Guardian. In August 2014, Russia banned the import of certain foods and drinks originating from the European Union as a response to Western sanctions over Ukraine’s crisis. Russia is the primary export destination for the EU's meat and dairy products. In 2013, exports to Russia were worth €2.3 billion. Since the ban took effect, the European Commission has announced emergency market support measures for the dairy sector, and handed financial help of up to €125 million to help farmers cope with the impact of Russia's ban. Earlier, the Commission announced roughly €32 million aid for peaches and nectarines, and €125 million for perishable fruits and vegetables. The EU executive pledged an additional €165 million in October in aid for farmers affected by the Russian sanctions. How do you feel paying more in taxes to support the farming community? Then there is your other boondoggle called Ukraine that is short 500,000 tons of coal going into winter and no money to pay for EU gas supplies. Sanctions never work very well against large nations.